There&apos;s an alternative theory of the 2007-2008 financial crisis in which it was just a minor hiccup that would have worked out fine for all concerned if the meddling U.S. government hadn&apos;t been so trigger-happy in bailing out basically sound but momentarily embarrassed financial institutions.1 I mean, you probably won&apos;t actually run into anyone who believes this theory, because it is a pretty loony theory. And yet! It keeps coming up in court, which I guess means the courts are full of loonies, QED. Obviously Hank Greenberg is the most vocal and delightful proponent of this theory, since he&apos;s been suing the government for ever and ever for taking over AIG when AIG actually would have been just fine with a little eleven-digit low-interest loan from the government. 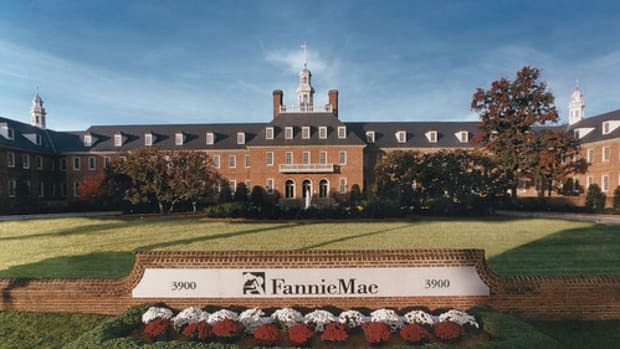 But Fannie Mae and Freddie Mac shareholders have come on strong of late, with weird lobbying for re-privatization of their shares and, now, a lawsuit filed yesterday seeking $41 billion in damages over their bailout. so the boards approved a takeover and that was unfair to shareholders, and an unconstitutional taking of private property, so the shareholders should get their money back. At the time the conservatorships were imposed, not only were the Companies adequately capitalized, ... but each company&apos;s capital was substantially in excess of its capital requirements. Moreover, each company&apos;s ability to raise capital from the public equity and private capital markets was more than sufficient to allow it to absorb any potential future losses, particularly in the Companies had been allowed to offer terms to potential investors as favorable as those demanded by the Government in exchange for the extremely costly capital it provided upon taking control of the Companies. "We didn&apos;t need a bailout" is I guess a better argument, legally, than "we needed a bailout but yours was a little too expensive," but also probably less plausible? Some people, for instance, thought at the time, and think now, that Fannie and Freddie were insolvent when they were taken over, and that even if they weren&apos;t they were well on their way there.5 And "we would have been fine raising billions of dollars in private capital in September 2008" is the sort of argument that it is best to make, um, a long time away from September 2008. Preferably a long time before, rather than after, but you go to war with the imaginary capital markets you have, or something. But the ultimate point of these lawsuits are the same: the boards of Fannie and Freddie, like that of AIG, were coerced into agreeing to a shareholder-fleecing government takeover, and that government takeover may have been good for the world but was nonetheless bad for private company shareholders.6 Which, for AIG, is, like, an argument, anyway. But for Fannie and Freddie it seems a little weird. These were "government sponsored enterprises" with a public purposes, and an implicit government guarantee. The implicit deal was, I suppose, that Frannie&apos;s private shareholders got the benefit of that implicit guarantee in the form of cheaper financing costs and more profits during good times, and in exchange they ran the risk of being treated as something slightly less sacrosanct than private property owners in bad times. I mean, implicitly. Who knows what anyone thought the actual deal was; that tradeoff wasn&apos;t spelled out anywhere, and the plaintiffs here point to lots of Congressional, regulatory and other statements seemingly designed to reassure Frannie equity holders that their investment was safe and their companies were private companies rather than instrumentalities of the government. Maybe someone believed those statements. It&apos;s not immediately obvious what the relationship is between this lawsuit and the people who now own Fannie and Freddie preferred and common shares and are lobbying to have the companies re-privatized. Lots of those shares have changed hands, suggesting that the plaintiffs who lost money on Frannie shares in 2008 are mostly different from the current shareholders standing to make money on a re-privatization. Casual Googling suggests thoseshares are generallyup today after the lawsuit was filed. But if you were in Congress or Treasury and pondering whether or not to re-privatize Fannie and Freddie, wouldn&apos;t this suit be a reminder of what a bad idea that would be? Fannie and Freddie were designed to carry out a public purpose while also making money for private shareholders. When those goals conflicted, the public purpose won and the private shareholders were thrown into the abyss. If you&apos;re the government: that&apos;s perfect. Except now those shareholders are suing, as shareholders tend to do. If you&apos;re the government: why would you set yourself up for more of that? 1.I exaggerate. The theory, for any financial institution, is really more like "our institution was fine, but got a bailout with harsher terms than it should have because the government wanted to use us to help out other, more favored institutions." So AIG got a harsh bailout to help its CDS counterparties, Frannie got harsh bailouts to help out mortgage lenders, JPMorgan was forced to take TARP to cover the stigma of other weaker banks that had to take TARP, etc. Congress and even OFHEO itself repeatedly exerted pressure on Fannie Mae and Freddie Mac to delve deeper into the subprime and Alt-A mortgage market. ... Faced with directives from Congress and agency regulators to accumulate subprime and Alt-A holdings, the Companies did as they were told. As Fannie Mae&apos;s former CEO, Daniel Mudd, later explained, "Fannie Mae faced the danger that the market would pass us by. ... We were afraid that lenders would be selling products we weren&apos;t buying and Congress would feel like we weren&apos;t fulfilling our mission. The market was changing, and it&apos;s our job to buy loans, so we had to change as well." Mudd argued that a relaxed cap would let his company provide that liquidity. “A moderate, 10 percent increase in the Fannie Mae portfolio cap would provide us with flexibility . . . and send a strong signal to the market that the GSEs are able to address liquidity events before they become crises.” He maintained that the consent agreement allowed OFHEO to lift the cap to address “market liquidity issues.” ... Fannie Mae executives also saw an opportunity to make money. FHFA found that Freddie’s unsafe and unsound practices included the purchase and guarantee of higher-risk loan products in 2006 and 2007 in a declining market. Even after being told by the regulator in 2006 that its purchases of subprime private-label securities had outpaced its risk management abilities, Freddie bought $22 billion of subprime securities in each subsequent quarter. Mudd told the FCIC that its regulator had never before communicated the kind of criticisms leveled in the September 4 letter. He said the regulator’s “chronicling of the situation” then was “inconsistent with what you would consider better regulatory practice to be—like, first warning: fix it; second warning: fix it; third warning: you’re out of here. Instead, they went from zero to three with no warning in between.” A review of the examination reports and other documents provided by FHFA to the FCIC largely supports Mudd’s view on this specific point. While OFHEO’s examination reports noted concerns about increasing credit risk and slow remediation of deficiencies required by the May 2006 consent agreement, they do not include the sweeping criticisms contained in the September 4 letter. Basically the government was happy with Fannie and Freddie taking enormous credit risk until one day it wasn&apos;t.
In November, Fannie and Freddie reported third-quarter losses of $1.5 billion and 2 billion, respectively. At the end of December 2007, Fannie reported that it had $44 billion of capital to absorb potential losses on $879 billion of assets and $2.2 trillion of guarantees on mortgage-backed securities; if losses exceeded 1.45%, it would be insolvent. Freddie would be insolvent if losses exceeded 1.7%. Moreover, there were serious questions about the validity of their “reported” capital. flawed, and resulted in the company substantially understating losses. Nearly all of the loss projections calculated by Morgan Stanley showed that Fannie would fall below its regulatory capital requirement. Fannie’s projections did not. These actions, while beneficial to the economic welfare of the nation, destroyed the value of Fannie Mae&apos;s and Freddie Mac&apos;s common and preferred stock and trampled the private ownership rights and property interests of the shareholders who owned these publicly traded Companies - the very same companies that the Government had privatized years ago for its own financial benefit.